Square-Enix boss Yoichi Wada recognizes that many fans didn't enjoy Final Fantasy XIII, and admits that the developer isn't sure where to take the series from here. I may have personally enjoyed it, but to say that Final Fantasy XIII was a bit of a "divisive" game within the Final Fantasy fanbase would be an understatement. Fans praised the battle system and gorgeous presentation, while those who didn't like it complained about unlikable characters and an overly-linear progression (even by the series' standards). Of course, none of that stopped the game from selling 5.5 million copies around the world. Still, Square-Enix CEO Yoichi Wada told Gamasutra that the detractors' complaints hadn't fallen on deaf ears. "Looking at the numbers alone," said Wada, "it is pretty good, because we were able to release the latest Final Fantasy in all three markets of Japan, United States, and Europe in a very short period of time ... [but] when it comes to the customers' reaction to the quality of the game, some value it highly and some are not very happy with it." This seems to be part of a larger conversation within Square-Enix - and the Japanese games industry as a whole - about the evolution (or lack thereof) of its titles. The JRPG genre in particular has come under criticism lately in the West for "stagnation." With its JRPG core under fire and facing an increasingly dominant Western development scene, Wada admitted that Square-Enix wasn't sure what it wanted to do with Final Fantasy following the online Final Fantasy XIV. "There are all kinds of games around in the market today. Should Final Fantasy become a new type of the game or should Final Fantasy not become a new type of game? The customers have different opinions. It's very difficult to determine which way it should go." 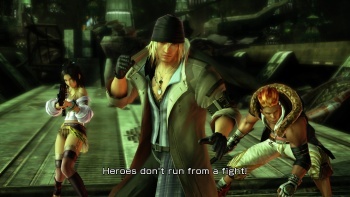 Wada had previously said back in January that FF13 could be the last of "this type of game" at Square-Enix.